We were always a bit skeptical about the whole idea of eBooks – we’ve always felt more comfortable with a battered old coffee- stained paperback – but a couple of long train journeys and hideous airport delays made us appreciate the value of having a couple of electronic books loaded on our phone (courtesy of the free Plucker reader and the superb free Project Gutenberg library). After a quick dabble, we rather liked the cut of Sony’s first Reader Digital Book, and this update offers re-styled controls that mimic paper page turns more effectively and comes with improved navigation. 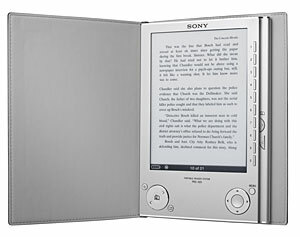 The screen looked very crisp on version one, but Sony are claiming that their next-gen ‘electronic paper’ display delivers an even faster response and contrast ratio, making it easier for getting stuck into a good read on bright sunny days. The hi-res screen supports eight levels of gray scale for displaying crisp text, images, and graphics, and the reader can also double up as a viewer for Adobe PDF document, RTF, text and JPEG files. Sight impaired viewers will appreciate the option to magnify the text in three sizes, while the landscape mode offers another level of magnification (as well as a wider page view). Expansion comes in the shape of Memory Stick Duo or SD memory cards with a new USB Mass Storage mode offering fast transfers from the user’s PC. The PRS-505 comes in silver and dark blue finishes, with the battery keeping you stuffed full of literary goodness for up to 7,500 pages of continuous reading. 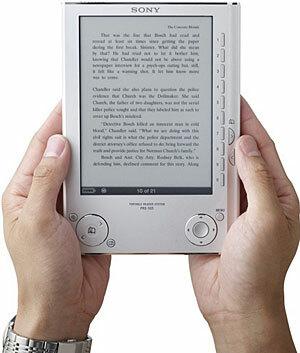 The new Reader will knock out for around $300 – cheaper than the rumoured Amazon eBook reader, although that comes with Wi Fi – and comes complete with a USB cable, eBook Library PC companion software, and a – oooh! – colour-coordinated, protective soft cover. 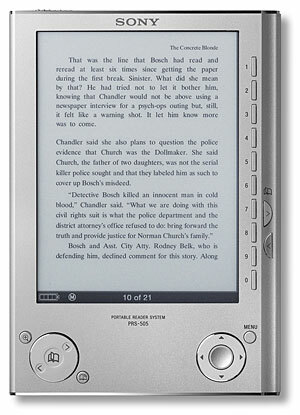 Where can I buy a Sony ebook in UK? Is there even a UK-preferred book list?